Refugio County courthouse, Refugio Texas. 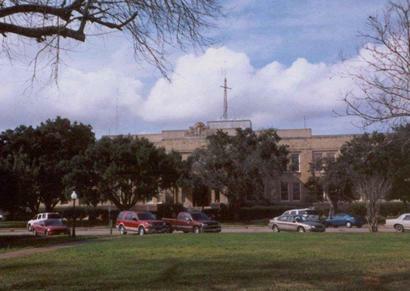 The 1919 Refugio County Courthouse, obscured by the trees. 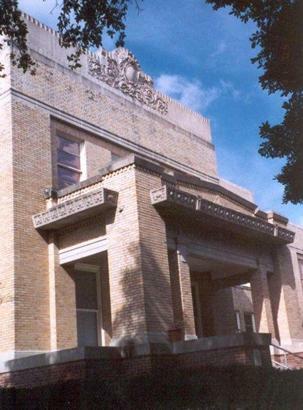 The 1919 Courthouse is one of many in South Texas designed by Atlee B. Ayres of San Antonio. The county and city of Refugio are named after the Spanish Mission De Nuestra Se�ora Del Refugio (the Mission of our Lady of Refuge) established here in 1795. 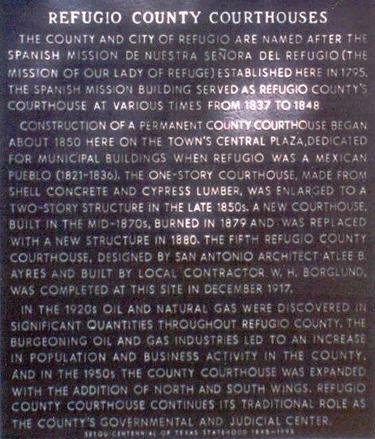 The Spanish mission building served as Refugio County's courthouse at various times form 1837 to 1848. Construction of a permanent county courthouse began about 1850 here on the town's central plaza, dedicated for municipal buildings when Refugio was a Mexican pueblo (1821-1836). The one-story courthouse, made from shell concrete and cypress lumber, was enlarged to a two-story structure in the late 1850s. A new courthouse, built in the mid-1870s, burned in 1879 and was replaced with a new structure in the late 1850s. A new courthouse, built in the mid-1870s, burned in 1879 and was replaced with a new structure in 1880. 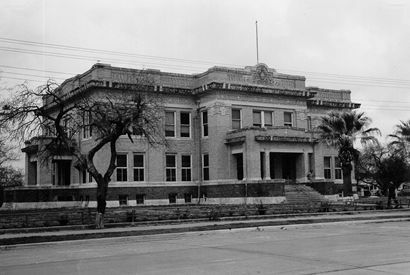 The fifth Refugio County courthouse, designed by San Antonio architect Atlee B. Ayres and built by local contractor W.H. Borglud, was completed at this site in December 1917. In the 1920s oil and natural gas were discovered in significant quantities throughout Refugio County. 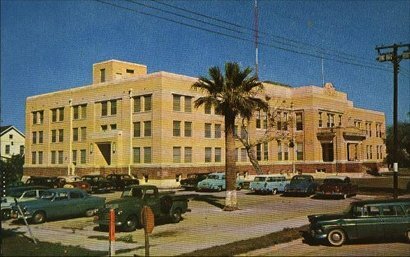 The burgeoning oil and gas industries led to an increase in population and business activity in the county, and in the 1950s the county courthouse was expanded with the addition of north and south wings. 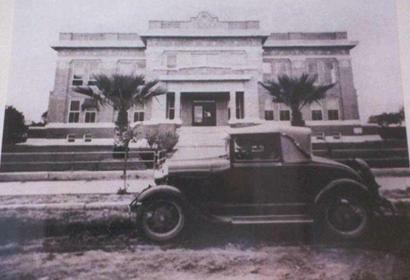 Refugio County courthouse continues its traditional role as the county's governmental and judical center.